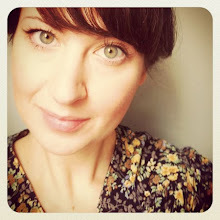 I discovered Daily Candy in Pittsburgh a few years ago when a dear friend, and my boss at the time, and I were scouting up-and-coming designers for her darling + fabulous indie boutique. At that time, the online showcase delivered daily inbox treats in only a few select cities, but, as always, displayed the finest makers and their wonderful handmade treasures. It dawned on me one day, whilst feverishly hunting for the next big thing, that I was a maker and I made wonderful handmade treasures, too. I was hooked and I wanted in! After years of wishing and hoping that one day my little company, Giant Dwarf, would be a part of this sweet society, I uncrossed my fingers and gave myself a pat on the back when Daily Candy recently contacted me. They were directed to me by the lovely ladies at Art Star and I was soon checking my own facts. 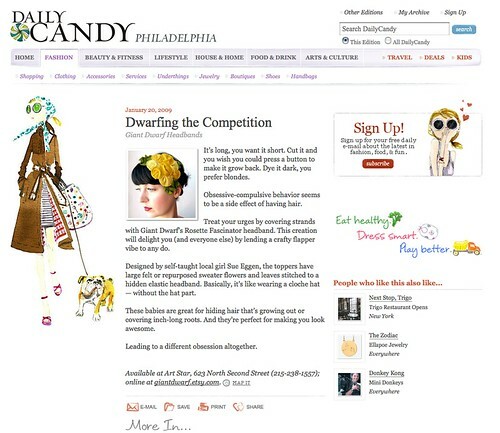 In no time at all, I was featured in the Philadelphia Edition, cleverly titled Dwarfing The Competition, featuring the Rosette Fascinator Headband. Indeed a sugar-coated moment that will stay sweetly preserved forever!